- Each map has nice details and there's especially a thoughtful use of textures. A few months ago, one of our readers was kind enough to suggest two map sets for us to try our hands on. Stormwalker's Oblivion from 2015 seemed to deserve the attention, especially since it didn't get nominated by a single vote in Doomworlds yearly Cacowards thread. 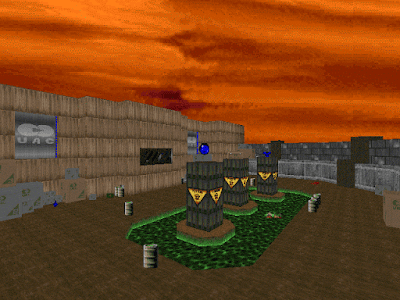 The episode was created for limit removing ports, and runs over Doom's first episode. Besides a few new textures snacked from Community Chest 4, a few midi tracks from Plutonia and a darkened imp sprite, the wad basically emulates the familiar look of Doom's first episodes. According to the txt, part of the maps are remakes or tuned up versions of a 2010 release called Phobos Massacre from the same author. This short start level is tight on ammo and exposes you to a lot of dangerous snipers, thanks to several windows. There are some promising architecture here, and the design looks clean and polished with nice details. I like all the situated windows, and the open yard centerpiece with the bridge and the columns is definitely the most noticeable and memorable area. I also like how the corners are cut in angels of 45 degrees instead of 90, and there is a good variation of different flats and textures even within rooms. Every texture seems like it has been deliberately and thoughtfully chosen. The "Metal1" texture is nicely applied over the entrances to the yard, and the textures with horizontal lines flow nicely together with the various windows and differing ceiling heights. A clever trick has been used in the open yard to cover the upper parts of the windows utilizing the "Brnbigc" texture, thus giving it a symmetrical harmony with the "Brown6" texture. The areas south and north of the main yard are unfortunately not interesting enough, and the difference from the ceiling height in the main yard to the rooms on each side visually neglects logic. Most of the smaller rooms in the west serve only to showcase some dead scenery with some corpses and barrels - which is pretty useless and an unused potential. The map also disappoints with its two rather boring secrets, but all in all, for a starter this sure does look promising. Oblivion sets the bar nicely with this opening map. It would fall in the upper end of "small maps" and is considerably bigger than Doom's original E1M1, yet maintains a fairly simplistic layout. The texturing is dominated by a tan green tech-wall from CC4, a beautiful custom texture that blends perfectly with the more familiar stock selections. The new, darker imps add a welcomed flavor to the episode as a whole. 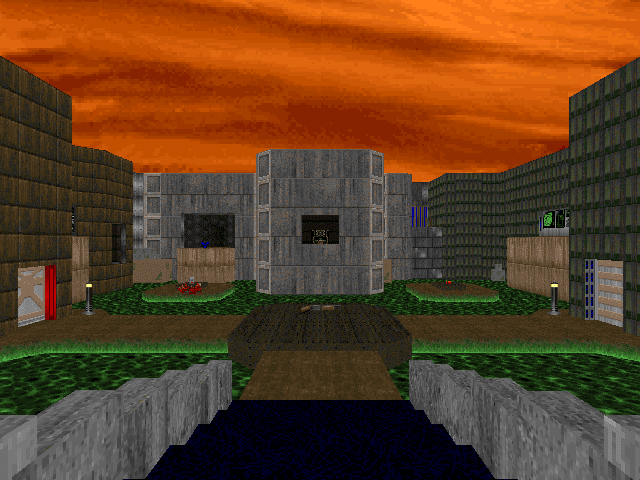 As will soon turn into a trademark for the set, the map enjoys surprising you with simple, well timed monster closets that add both color and suspense. Ammo is tight here, but you get a handy shotgun in the very first room. You'll still find yourself pistol whipping the majority of these low end monsters, but a few well placed barrels help with the fun. Architecturally there is nothing great here, but everything is quite modern and solid looking with a classic take. The biggest flaw is certainly the bright garden bridge walk, where the ceiling height is way too low compared to the interior, thus creating a rather obvious visual blunder. A good portion of the map is optional, but since there is not much substance to explore, this basically just adds some more time to it. This level seems to have it all. From the first open acid drenched yard it looks so interesting because of the different textures applied on each of the four buildings surrounding it. From the start you'll teasingly see an exit door through one of the windows. Before you get to it, you will traverse through different and interesting sections. The room with the yellow key is especially inventive, and there are several ambushes which make this a dangerous ride, especially near the blue key. There is also a touch of mystery here as you'll notice a secret garden, and how to get to it won't be all too obvious. When we found our way out there and discovered the supercharge I sure got that classic Doom Knee-Deep in the Dead feeling, and all this without the scenery being a total rip off but something which stands solidly on its own. The details are not over the top, but enough to make it interesting and special. The same goes for the secret passage which leads to the chaingun. A classic kind of secret, but with it's own distinctive character. The noisy crushers and a few somewhat narrow corridors might be the only thing which felt a bit annoying in an otherwise solid map. The exit is nicely situated and allows you to peak back at the very start of the map before you flip the switch. This is a really slick map constructed around a central garden soaked in acid. I would probably have opted for a lower light level outdoors, since full blown brightness tends to kill the atmosphere. The map interconnects in a sweet manner, yet it's a fairly easy and straight forward task to fetch the keys. I felt a slight disappointment upon realizing the neatly placed yellow key did not trigger an ambush of any sorts. 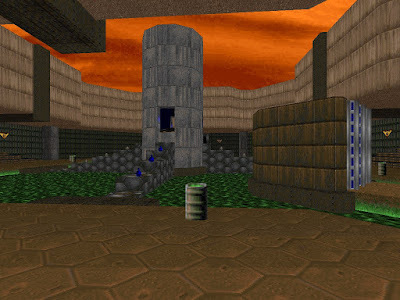 The map's highlight comes in form of a lengthy track of multiple secrets in a row, revealed behind a shoot switch wall that then takes you for a ride through corridors and stairways until you end up in a really nice, curved garden area. I'm not sure what to think of the bulky silver and red poles used for decoration in this area, but that's a minor detail. The placement of the secret mega armor is excellent, as it teases you from the start of the map but is not up for grabs until you reach the exit area. Texturing and indoor light detailing are really slick all through, and one would be hard pressed to peg this map as anything but pretty sweet. Once again there are great texture combinations and an interesting light variation on display. The garden to the north is a very good example of this, and the inner darker halls showcase some nice playful light-detailing, which gives this map so much atmosphere. The yellow key basement is an exciting and tense moment, and the blue and red key pickups are also interesting and challenging. I especially enjoyed the area with the blue key on top of the stairs and the bars which lock you inside as soon as you have grabbed the key. That is a classic way to booby trap a key, but unfortunately in this case it's possible to get stuck here on multiplayer if you die prematurely. The first demons and specters appear here. The layout is good, as it leads you around the inner hall. The secrets - and the secret exit, add a nice exploration element, and are fun to track. There is a tendency of a rather pointless placement of several crates in the corners of the inner hall, the northern yard and in the alcoves in the secret exit area. These crates serve no purpose apart from just filling up empty space in an attempt to serve as detailing. The difficulty picks up slightly in this map, and we also get our hands on the first rocket launcher and a chaingun. The launcher is a great tool for dealing with the two sizable waves of monsters released upon picking up the red key. Design-wise, I'm a bit torn on this map. I enjoyed it more on my first play-through than the second. Even though it has a nice exploration element to it, with five secrets in all (including a somewhat less than creative secret exit), the map feels a bit confusing for its limited size, and a few of the areas seem a bit forced. My least favored part would be the dark yellow key basement with its walkway and acid pool. The entry to the room is a simple lift taking you down there, and it's a dark and unpleasant part of the map. Similarly, I found it to be a lazy way out from the authors side to simply teleport you from the sealed red key trap. Such relatively simple ways of connecting a few of the sections of the map would seem less impressive than how it's executed in the former entries. That aside, it's still a solid piece. This is a nice piece which instantly grants the proper vibe of a secret map because of its distinct scenery consisting of a big hall with an unreachable exit tower in the middle of it. There is a good flow and some nice variation throughout the map, from the giant start area to a classic tech maze which is not too large or too dark, to an interesting outdoor section in the south. A few of the connecting darker corridors could perhaps have been reduced. New ambushes constantly open up and threaten the player and simultaneously transform the rooms. The rocket launcher and supercharge secrets in the southern area are very cool, but again there is an unfortunate illogical height variation between an indoor area and the outdoor sky height. The first Cacodemons and Lost souls appear in this map, and we also get a nicely timed berserk. The blue key seemed a bit wasted though as it's just tossed in the maze area close to the corresponding switch. This is another map that worked better for me on the first play-through than the second, and I'm not sure why. You start in a large acid garden with a central construct that require you to raise a set of stairs in order to exit the map. You have different doors on each side of this area, leading you to the various key chases. The least enjoyable one would be the blue key track which consists of a mediocre E1M2 maze area which pitches you against Lost Souls and Cacodemons as well as lots of movement restricted alcove imps. The gameplay flows quite well here, but maybe more so when played successively than from scratch. The final ambush wave is a tense, nice climax. I didn't particularly find the excessively explanatory letters on the floor to be a detail to my liking as they come off a bit tacky and cartoony. The strong point of the map is the constantly supplied and very well fine-tuned traps, making the gameplay an on-your-toes kind of experience, despite consisting of primarily low class monsters. I found it slightly confusing because of the symmetry, but well executed all in all. We had some ammo shortage in this map. For the first time, the layout isn't too impressive and it could be that this is an old map which just received a serious facelift. The red key situated in the small dark room is probably the first time we have seen an unmotivated placement in the episode this far. You don't get to see this key from a distance before you suddenly bump into it in the end of an anonymous room. Luckily the ambushes in this map function very well, as usual. At certain points the layout seems to have some problems, as for instance with the pointless blue key which you encounter instantly behind the yellow door. I also felt that several of the areas are simply too big and spacious. This goes especially for the square area to the northwest which seems to be in lack of some good ideas and feels a bit disconnected from the rest of the map. This is actually an optional area which fails to be especially interesting, but you'll get a chaingun there, as well as a mega armor and a rocket launcher if you can locate the two secrets. The outdoor area on the other side of the map (which goes all around the eastern side) feels a bit too big and in lack of ideas. The switches are just placed inside two similar dark and bland rooms, but at least the different textures on the outer buildings add some needed variation here and prevent the area from being totally mundane. Both of us ran out of ammo here. Perhaps knowing the map better would have prevented this, but I'd say it's a bit on the strict side, and it would have been more fun if it was less hampered by this. The map comes off as a bit less inspired with its design too. I did not enjoy the dark basement area with the chaingun, and the map has a deliberately confusing design that will bewilder you quickly. There is a cool noteworthy secret if you catch a small alcove passage as you ride a lift, much like the one found near the end of Doom II's 17th map Tenements. To elaborate on the somewhat less than enthusiastic design here; a lot of the detailing consist of stock crates piled on top of each other in the corners of the rooms, and this gets old real fast. One can sense the author going through the motions, while maintaining a decent level of quality. It's just not a very fun map compared to some of the other entries in the set, and it seems like it was a chore to tune it up. This map has a more intricate route and layout. The teleporter shortcut between the two blue doors felt a little cheap however. It seems like none of the rooms are square thanks to a creative way of cutting angels and edges that leaves them with distinct shapes and interesting visuals. You have to jump through a window to reach a secret garden, which is always a cool and creative touch. The large yard on the southeastern side is the most interesting part of the map, and it's also reused once with the addition of some instantly spawning Cacodemons to keep you busy. The difficulty is elevated a bit here, and you'll also run into the first Barons of the episode. Like the previous map this one also tries too hard to confuse you through an overly complex layout. We also get the same tired stock detailing of crates stacked on top of crates. In-between this "decent mediocrity" however, we do catch a few really neat rooms and sections where the author's eye for excellent texturing and clean aesthetics salvages it from mundanity. We're introduced to the first Barons here, in a small garden area littered with imps behind caged windows and on far up ledges. Luckily there is also a rocket launcher to deal with the fuzz. The map is a bit too tight with the ammo, especially when approached from scratch, and although there is a nice pace to it, I do find it somewhat underwhelming and borderline annoying at times. I found myself applying the chainsaw quite a bit, and luckily you can fetch it early on by visiting a neat secret reached through the first acid moat of the map. Despite a decent level of detailing this feels like the most simplistic map in the set, much due to a few large halls and long corridors. The dimensions in some of the rooms and the distances in the map just seem a little over the top, especially within the part behind the two red doors. This area is characterized by several corridors and feels quite uninspired. The most interesting thing about the map is that you can choose between different routes and in what order to clear out the rooms - both before and after the red doors. The Baron ambush inside the blue door is tense, and feels almost like some sort of a boss fight. There is a plasma secret here that managed to outsmart us. Some well practiced coop tactics allowed us to saw down several Barons here, thus saving a ton of ammo. Again, the author have opted to increase difficulty by adding a few more high end monsters, but restricting the ammo. The map is fairly complex for its mediocre size, I'd say a bit too confusing for its own good. We did not manage to unlock the plasmagun, which would have made life easier for sure. I thought the spawning ambush triggered upon picking up the blue key was a bit much, especially considering our low ammo, and it led to much scrambling for leftover clips and some health costly attempts of igniting infights. The map looks quite nice, but it never peaks with the visuals, all in all leaving it as a solid affair but not very memorable. You can't really knock the texturing, or the way the various traps are executed, but it does become a repeat of what you've seen in the previous maps, just attached to another semi-confusing layout. This map looks really nice, and has a lot of atmosphere thanks to the nice caves and rock textures, but it's a shame that these parts are not bigger and more elaborate. It feels like a good opportunity missed. The base flows perfectly together with the caves and the rock textures and distinguishes this map from the rest. The ambush which appears in the open yard to the north is the most dangerous moment of the map. The part that follows in the eastern section though, feels like a pointless prolonging of the map. It's an anticlimax after the main battle and the environment is not interesting enough, and it also includes some strange and meaningless corridors and teleportation. This part only functions as a rather unmotivated transport route towards the exit. You have to traverse through two blue doors and backtrack several rooms you already cleared before reaching the exit. I think it would have been much better to place the exit a little more towards the north, and perhaps connected the southern and northern yard with an open area on the eastern side of the base. Allowing you to peak into the exit like in some of the traditional Knee-Deep in the Dead maps such as E1M7, might have added something to it as well. As it is, the exit part is quite forgettable. The episode finally gives us a fresh look here, and although it comes late, this adds a lot to a theme that was wearing thin in the previous maps. This level has more of an Ultimate Doom Episode 2 and 3 feel to it as it utilizes the ever cool rock textures to create cave areas. The caves beautifully blend with the tech base situated in the midst of the mountains, especially given the custom brown tech texture that dresses the majority of the interior. Detailing and light level efforts seem much more inspired here, and I have to wonder if this is a theme the author should have experimented more with in the episode as it seems to have sparked his enthusiasm. A few of the views from the surrounding mountains towards the techbase are really wonderful. There is an unfortunate design error after the blue key pickup, making it possible to get permanently stuck in cooperative mode. Also, the gameplay fails to peak by being somewhat ammo conservative yet again. Aesthetically this stands as the best map of the episode, in my opinion. This map could have been the most atmospheric of the set, but the quality drops in the second half. The first part is a techbase with an exemplary good use of light-levels. The red key ambush with the instantly lowering floor is a memorable trap, and the yellow key has a clever and tempting position as you will have to work your way through several rooms before you can enter the balcony. Sadly, this map is mostly an indoor map, only offering up a tiny Cacodemon infested yard before you reach a teleporter that will transport you to the second part - a cave area where the final battle takes place. This part is an attempt at making a hellish finale, but unfortunately fails to be as memorable as the author probably intended. After fighting a bunch of Cacodemons and Barons, you basically get a huge red cave with some Imps and Lost Souls roaming around, and as soon as you have located the room with the invulnerability you can just run for the exit and pass through a Spider Master-mind and two Cyberdermons on a cliff. Just skipping the last badasses instead of killing them isn't especially epic, but it looks like this is how you are encouraged to finish this episode. The last map becomes somewhat of a disappointment. The idea of teleporting the player into Hell after initially giving the usual run through an episode 1 styled techbase, could not be less original of course - but that is not to say I mind cliches if they are well executed. Unfortunately, the hell part one teleports to is less than impressive. Its stark red colors create a memorable contrast to the rest of the episode, but it's obvious the author does much better when creating indoor tech base environments than hellish cave areas. The first part of the hell side of the map consists of a green-brown mountain area with a lava pool and several monsters spawning in. There are some really awkwardly designed stalagmites to one side of it, and a door leading to the final, red hell part. This is also where the gameplay takes a complete nosedive. Two Cyberdemons and a Spider Master-mind placed on ledges, and several monsters cluttering the walk to get to them make for a silly, unfair fight to wrap things up - unless you grab the invulnerability and just dart past them. We managed to die in this area, and it sealed off for good so we couldn't give it another shot without restarting, and as such ending the journey on a less than satisfying note. Oblivion is certainly an episode with a lot of quality maps. Each level has nice details and there's especially a thoughtful use of textures, with clever combinations on display. Good use of light-levels adds a lot of atmosphere. 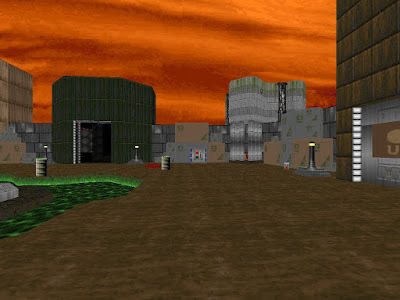 The maps take place both inside and outside of various techbases and exceed the original Doom a little when it comes to realism. There is a constant and clever use of ambushes as you progress through the corridors or pick up items. The use of the blue "Compblue" texture inside the monster closets is very typical for the episode, and this colorful signature also exemplifies how every corner and void in a given room flow together with the surroundings. This shows how a gameplay element like the monster closet doesn't need to only have a technical function, but that it can also be used in a nice aesthetical way. 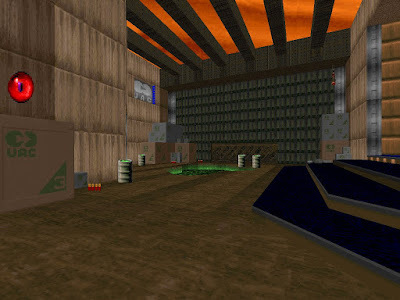 All the small dark corridors with the "Metal1" texture is another trademark of this episode, and several of the rooms must be said to have quite inventive furnishing and decorations. Perhaps there could have been some more use of hurt floors. 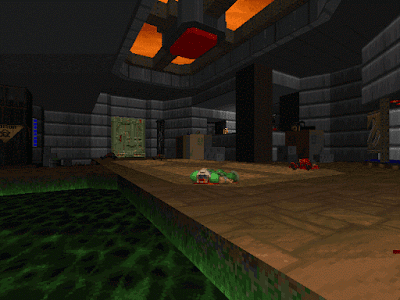 Apart from some green acid here and there, and a little bit of lava in the last level, there is a sparse use of liquid floors. Strangely we haven't seen any use of water at all, which is quite remarkable for an entire episode. 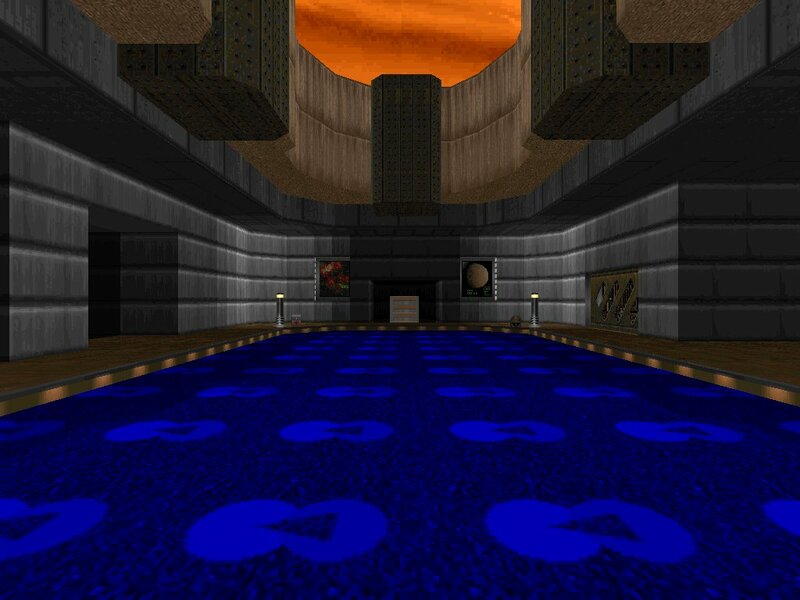 Some more utilization of hurt floor would have helped to differentiate between the maps, as they could be accused of being too similar (perhaps apart from the secret map, and E1M7, thanks to its rock and cave theme). The maps are well balanced and have a rising difficulty, and monsters from Dooms Episode 2 and 3 are also used, which I think was a wise decision as it makes the gameplay more interesting and varied. A more frequent utilization of the berserk could perhaps have been implemented to elevate the fun in a few of the maps. Having been in the position of touching up my old levels back in the days of stitching together Alien Vendetta, I know how it can be a tough call when to polish old work or instead just create fresh material. In a few of the maps in Oblivion, I get the sense the authors dissatisfaction with his original maps from Phobos Massacre carried over their spirit into this. 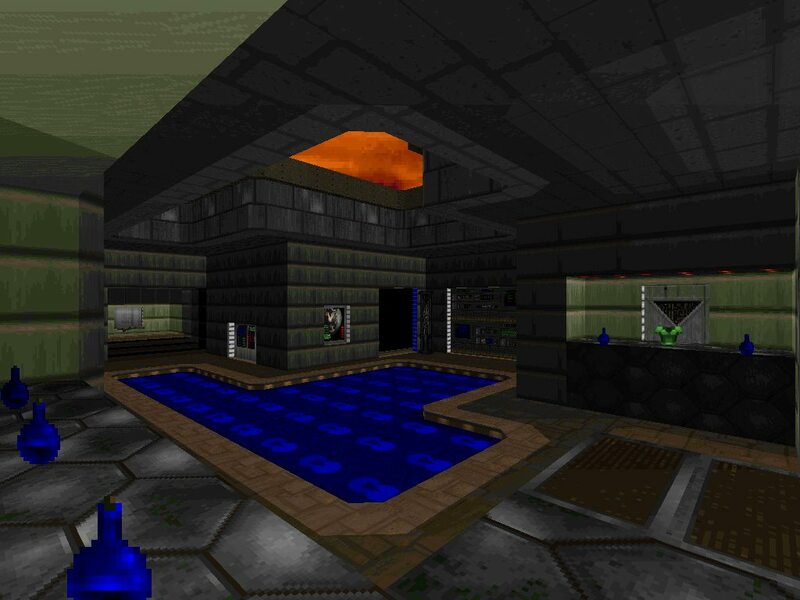 In such cases, it would probably have been better to scrap the map and start fresh - I'm thinking primarily of the somewhat "stock detailed" mid episode maps here, where you get rather simple rooms that have received a nice comb over as far as texturing and light levels go, but supply repetitive and creative lacking detailing as to "cover up" their simple nature. The fact that the map-set also require a limit removing port to run, really makes this less of an excuse. 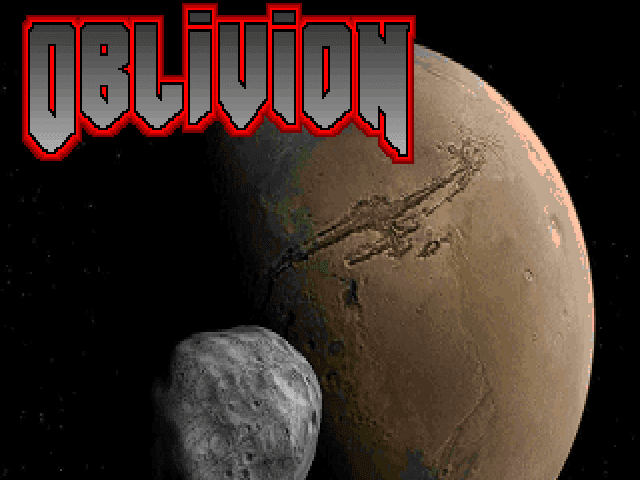 As a whole, Oblivion is solid. Anyone who cannot see the qualities of its well meshed texturing, proper scale, tasty light detailing and very well timed traps and monster closets, are probably too saturated on the stylistic approach and the theme the author chose. Work and thought went into making this a slick set. For me E1M7 is the real standout here, and if the entire episode had fallen into such a visual delight, this would have been a classic for me. But as it is, it just floats by on the strong points without really being fresh, overly moody, innovative or immersive. Even though there is a good and successful attempt at increased difficulty throughout the set, the gameplay does not really feel as fun as it could have been given somewhat more liberty with power-ups and ammo. Some impeccable barrel placements help greatly, though. As finetuned as it is, and as void of notable downfalls as it may be, this set does not really touch upon the greatness of the Classic Episode or Chris Hansen's Retro Episode. It's just a peg below those, both in gameplay and aesthetics, which makes it kind of easily forgettable or even excessive. Perhaps that is why the Cacowards of 2015 totally neglected to mention this episode, even though it most certainly deserved it ahead of some of the other candidates, in my opinion. For an episode released in 2015 it's unfortunately easy to fall into oblivion when you're standing firmly planted on the solid middle ground. Thanks for this review Martin and Anders! I really appreciate your criticisms as they are very informative and helpful. I will be reading this closely and taking notes in order to improve upon my map-making efforts. If I may comment briefly on the final showdown in E1M8, the Invulnerability Artifact which you encountered only spawns on the "Easy" difficulty settings(ITYTD and HNTR). On difficulty levels 3, 4, and 5 you are forced to fight the Spider Demon and the two Cyberdemons in order to exit the map. Nevertheless, the point is well-taken that this power-up renders the final battle toothless, and so in retrospect I should have found another way to curb the difficulty for the lower skill levels. Once again thank you for your review, I'm honored! Hi Stormwalker! Thank you for the feedback, and for the material to review :) It's a small travesty your work did not get a nod at the Cacowards. As usual, me and Martin go hard when we score, and as you can see from our review list - few pieces get to climb above the 4.0 level. Nitpickers to the bone! I hope to see more of your work, as it's certainly appealing and solid - and also hope you find the review encouraging as we tried to let our appreciation for its qualities shine through. Thanks for clearing up our error with the invlun. in E1M8. Did indeed not find this on our ultraviolence multiplayer playthrough, but we must have loaded the map up on the wrong skill when checking out some details afterwards. Good luck with future endeavours, I'm positive we'll check out anything you release. 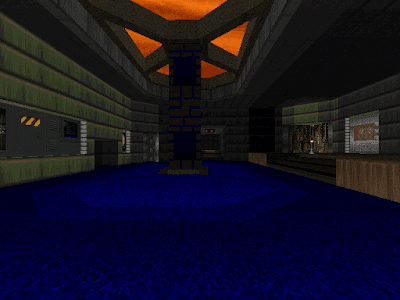 A new Episode 1 replacement for Doom was just released by veteran mapper Jan Van Der Veken. I just played through it, and I think you guys would absolutely love it. Jan clearly spent a great deal of time perfecting this mapset, and it shows. The wad is titled "No Sleep for the Dead". Check it out if you get a chance. glad to see that you guys really loved this set! i'm wondering if I didn't just suffer from map fatigue since I played PHOBMASS and OBLIVION right after each other.